National Portrait Gallery Installs Photo Of President-Elect Trump : The Two-Way The image dates from 1989 and shows Trump tossing a red apple. It was taken in 1989 by Michael O'Brien for a Fortune magazine story on billionaires. 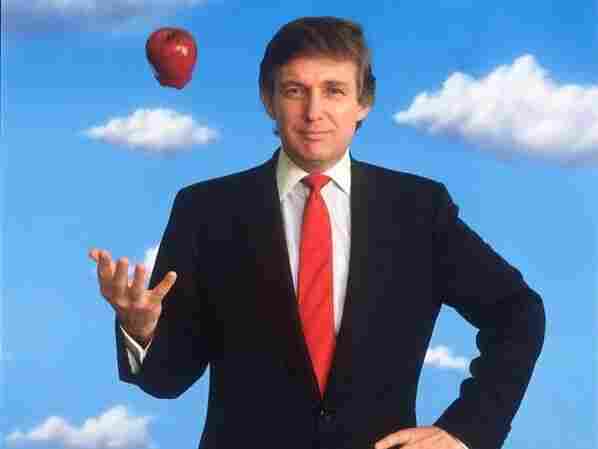 A 1989 photograph of Donald Trump tossing a red apple was installed today at the Smithsonian's National Portrait Gallery in Washington, D.C. The museum is known for having one of two complete collections of presidential portraits, the other belonging to the White House. This portrait of President-elect Donald Trump, however, isn't one of those official presidential portraits. The image by photographer Michael O'Brien became part of the museum's collection in 2011 as a gift from Bill and Sally Wittliff, along with 16 other portraits taken by O'Brien. While it wasn't known at the time that the photograph would one day represent a president, acquiring the piece helped the museum get ahead in one of its common practices. "We acquire pictures of the presidents before they become president — we have pictures of Andrew Jackson when he was a general — or of presidents when they are in the private sector. It's part of our coverage of the news and the contemporary history of the United States," David Ward, senior historian at the museum, said in an NPR Facebook Live interview today. Trump's official presidential portrait won't begin to take shape until later. "Toward the end of the presidential term we work with the White House, and they work with an artist to commission an official portrait." Ward explained. "It tends to be an oil painting, it tends to be large, it tends to be expensive, it tends to be more monumental." This photograph has led many lives, nearly disappearing into obscurity. In 1989, Trump posed for O'Brien, who was on assignment for a Fortune magazine story on American billionaires. From the beginning, O'Brien knew he wanted to place Trump against a backdrop of a bright blue sky and cotton ball clouds, a sky he says was inspired by the surrealist painter Rene Magritte. The apple was a last-minute addition, he told NPR. "On the day of the shoot I thought, 'It needs some type of action, something unexpected but telling.' Bingo! A big red apple popped into my head ... It was sort of subconscious the apple. It was sparked by a color scheme, and I later realized it was symbolic of New York." When the image was published for its original purpose in the Sept. 11, 1989 issue of Fortune, O'Brien was disappointed. "I was heartbroken; a good shot has gone to waste," he said. "That issue along with the newspaper and magazines goes out with the kitty litter." But about a year later, Random House asked O'Brien for the rights to use the image for the cover of Trump's autobiography Trump: Surviving at the Top. Over 20 years after that, the image was acquired by the museum. Today the portrait hangs under wall text that reads "2017 Inauguration, Donald J. Trump." When asked about having his picture represent the next president, O'Brien said, "It's pretty wild. I'm surprised. It was like a picture lost behind a stove, and now it's repurposed." The Trump photograph will be on view through February 26, 2017. A previous version of this story incorrectly identified the senior historian of the National Portrait Gallery. He is David Ward, not Michael Ward.